Here it comes: the future. The kind written about in sci-fi novels and displayed in D-list made-for-TV movies. The kind of future people back in the 1960s imagined would infect the early 2000s: flying cars, jet packs, and virtual reality. Well, flying cars are still out of the equation and jet packs have been deemed too explosively dangerous, but you better believe that virtual reality is on its way into our world. 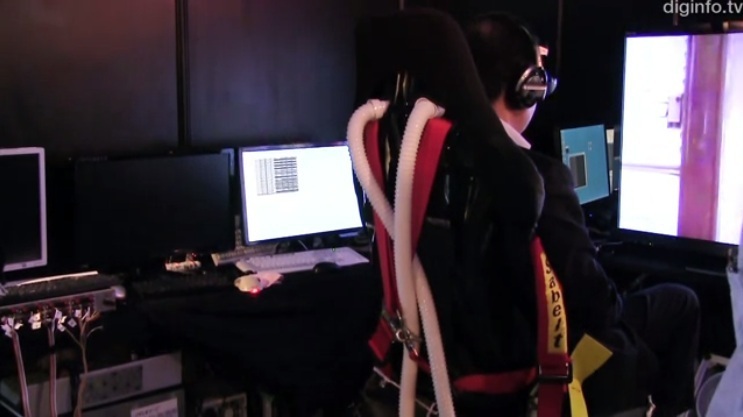 Revealed at the Digital Contents Expo 2012 in Tokyo, this technology claims to engage an individual’s senses to such a degree that it makes the person feel as if they are inhabiting another person’s body. This is some seriously strange stuff body swapping technology. To create this kind of sensation, the technology uses a vibrating chair capable of leaning back and forth, fans for creating breezes, foot pedals to create imitation walking, a 3-D monitor, and equipment capable of creating false smells. All in all, it’s an impressive system that makes it capable to artificially live a second life. For anyone wishing to become someone else, this may be the perfect opportunity. Of course, it could serve less ethically questionable purposes, such as allowing someone the experience of walking through an Amazon rainforest or running on a Mediterranean beach, without having to leave the comfort of a chair. This is most definitely going to be an interesting piece of tech to watch during the next few years.